gentleMACS Tubes are central components of our gentleMACS Technology. They contain built-in rotors that have been engineered to ensure the highest performance in the dissociation or homogenization of your tissue samples. gentleMACS C and M Tubes, together with gentleMACS Dissociators and gentleMACS Kits, ensure that you get the highest quality samples for downstream applications. The patented enclosure design directs the sample flow towards the stator to ensure thorough dissociation and homogenization. At the fixed stator site, the sample is processed through mechanical shearing that occurs within the narrow gaps defined by the distance between the stator teeth and the rotor. A rotating paddle draws the sample into the stator for processing and provides the exact amount of sheer force necessary to gently pull cells from tissues or intact molecules from within cells. Two types of gentleMACS Tubes are used with all three gentleMACS Dissociators. Purple-cap C Tubes are used to get viable single-cell suspensions for cell separation, culture, or analysis. The stator teeth of the gentleMACS C Tubes are equipped with spacers that define a specific distance between the rotor and the stator. This distance ensures efficient extraction of viable single cells from tissue samples. 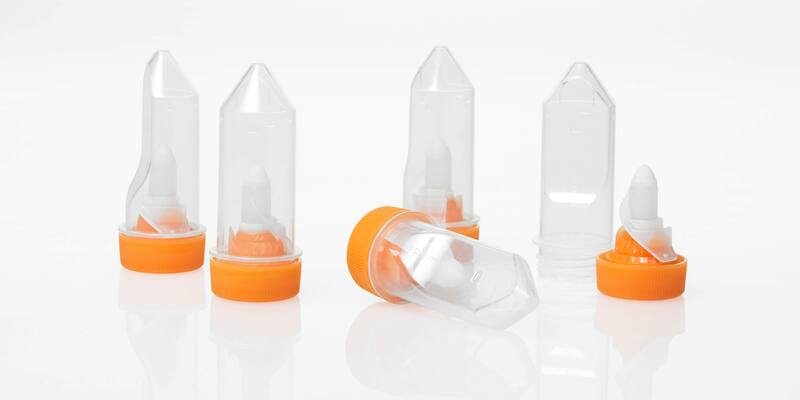 Orange-cap M Tubes are used to achieve thorough sample homogenization for subsequent molecular and microbiology analysis. In contrast to C Tubes, M Tubes lack spacers, which makes them perfectly suited for tissue homogenization for molecular and microbiology applications.